Daly does what he does. Perry, Small lead Senior Players. 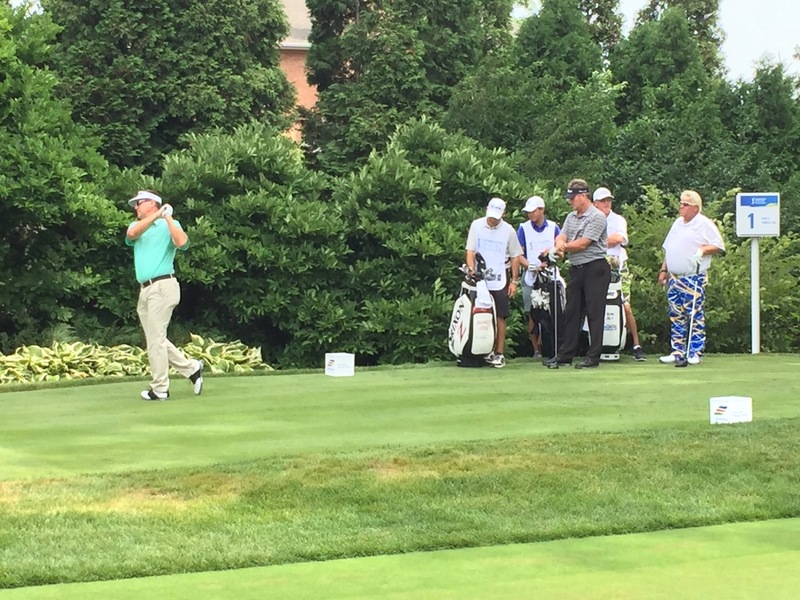 John Daly (right) and Todd Hamilton watch as Brandt Jobe tees off at Senior Players Championship. HIGHLAND PARK, Ill.—Kiawah Island and Erin Hills sound exotic. And they look great on television. But if you’re a spectator, a fan of golf who wants to see golf shots, here’s a bit of advice: The place you want to be is a traditional old-school country-club layout. The holes are close together. The ground is flat. There is walkable grass everywhere, so you don’t have to tromp through or skirt around high grass. A place like Exmoor Country Club, the fine old Donald Ross layout that is hosting the Senior Players Championship in north suburban Chicago this week. Another plus for fans of golf shots. Because the Champions Tour doesn’t draw the immense crowds of the regular PGA Tour, you can get up close and personal with the players. It’s also kind of a bargain. Weekly tickets start at $79. Daily tickets start at $35. For more information, click here. Oh, and they are fun players to watch. They not only are names out of the past, players who have won majors around the world. They also are players who have adapted their swings to the vagaries of the aging process. They can still hit the ball and score. But their games more closely resemble the games that mere mortals play than the PGA Tour’s young behemoths. And the senior tour is entertaining. For example, John Daly caught my eye in Thursday’s first round. Then again, Daly always seems to catch my eye. And not just because he wears those loud pants. Although Thursday’s pants—royal blue with swatches of gold and white—were pretty good. Whenever I’m at a tournament, the first names I look for are Tiger Woods and John Daly. With Tiger, you never know whan you’re going to see magic. With John Daly, you never know. Period. He could play like the big-hitting two-time major champion (PGA and British Open) with a deft touch around the greens. Or he could implode like he did at a Senior PGA in Benton Harbor a few years ago. He took a 10 using driver on a not-drivable par-four. Daly found a lot of shady spots in the early going. On this day, Daly was somewhere in between. On the first two holes, he hit his driver in the tree-lined left rough. On No. 3, he found the tree-lined right rough. And found himself two-over after three holes. A bold, long and accurate drive on No. 7 set him up for a birdie to get back to 1-under. On No. 9, though, Daly nearly drove his ball off the golf course, took a double-bogey 6 and made the turn in 39, 3-over par. Daly game over? Hardly. The big galoot birdied the first three holes of the back to get back to even, bogeyed No. 13 and birided No. 15 to get back to even. And that’s where he finished, with an even-par 72 that left him seven shots off the lead. Not the best of starts, but at least this Champions Tour major is a 72-hole event. Popular veteran Kenny Perry, a 23-time winner on the PGA (14 ) and Champions (9) tours, and University of Illinois coach Mike Small, who has been a force for years at the club-pro level, shot 65s on Thursday to lead the Senior Players at Exmoor. That’s the other appealing thing about the Senior—um, Champions—Tour players. They’re as honest and to-the-point as a country music ballad. 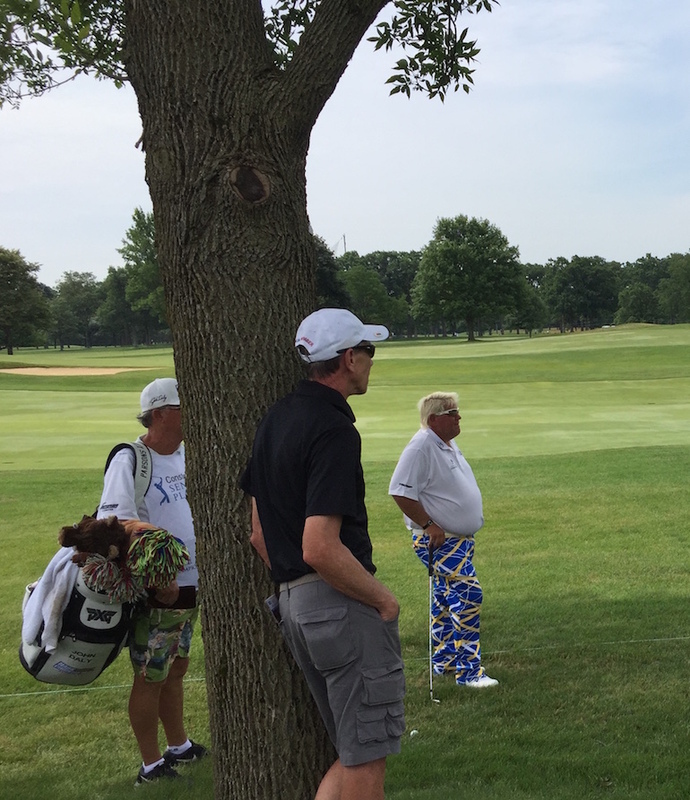 Take Jeff Maggert, who shot 66 and is one stroke back, along with Bart Bryant and Glen Day. How has his season has been going? “A little up and down,’’ Maggert said. “I probably haven’t put enough effort into it to really get on a run and play well. And then there’s Mike Small, who has become one of the nation’s top college coaches after starring at Illinois alongside a guy named Steve Stricker. Small has won a ton of Illinois Opens and Illinois PGAs, and he has won threee PGA Professional National Championships, which have earned him slots in the PGA Championship. Where he has also played well. Which is all pretty amazing because he doesn’t play a lot of golf. Twelve since last November? And he’s beating a bunch of guys who have played 12 competitive rounds since a week from last Tuesday. Pretty good stuff. The other thing is, even when the old guys play well, they remain appreciative. There’s no USGA obession with par at this Champions major. Not with 50 players under par, including 23 players who at least 3-under par. Old guys making birdies on a beautiful country-club layout that’s close enough to Lake Michigan to beat the heat. That sounds like something to watch. There’s a lot of golf in Bradenton & Sarasota: Here’s a guide to some of it.